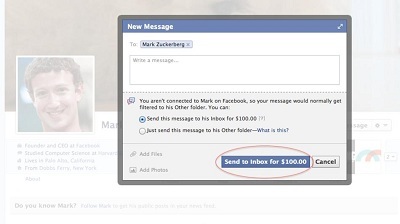 Facebook has introduced a system whereby you can pay to send a message directly to the inbox of your favorite celebrity. The system was extended to the UK yesterday. Although there are limitations, like you can only send one paid message a week, and the cost of the paid message could fluctuate, it is a simple way to get your personal message directly to your favorite celebrity. Facebook has been implementing a variety of payable services, and has devised a formula which calculates the rate of fame of the celebrity to work out a suitable cost for the message to be sent. You can still chose to send the message without paying for it; the message will simply go into the “Other” folder in the messages section. According to [Business Insider] Americans can currently message Snoop Dogg for $15.